I have a question regarding your PE-conjugated anti-Calreticulin antibody [FMC 75] (ab83220). I intend to use this product for detection of calreticulin on the cell surface. Do you know whether this mAb recognizes an epitope of calreticulin that is located intracellularly, or will it also recognize surface (ecto) calreticulin? The control stain on your website shows intracellular staining of HeLa cells, but I am specifically trying to detect calreticulin on the surface. According to http://www.uniprot.org/uniprot/P27797 Calreticulin is localized to the ER, cytoplasm, secreted, and on the cell surface, so rather than being a multipass membrane protein it is translocated to different regions of the cell. Thus, uniprot does not list specific amino acid ranges of the protein that are intracellular vs. extracellular when it is localized on the cell surface, and since it is most prevalent in the ER and cytoplasm our anti-Calreticulin antibodies were validated in ICC and flow with fixed, permeabilized cells. Thus, I am not sure whether or not our anti-Calreticulin antibodies, including ab22683, will bind to Calreticulin on the cell surface because I do not know what portion of the protein is extracellular vs. intracellular when it is surface-localized. 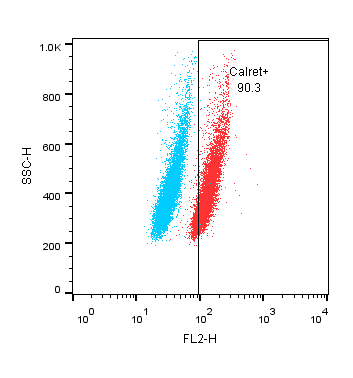 Hello, I ordered ab83220 anti-CALR antibody and I tested it in different human leukemic cells lines and different mutants for CALR. As in some cases I don't have membrane detection of CALR I was wondering if you know which part of the protein is recognize by the antibody (C-term or N-term). Indeed, I would help to confirm my results and go further in biological characterization. The epitope that this calreticulin antibody recognizes has not been mapped but it is expected that the epitope is on an extracellular region. The unconjugated version of this clone, ab22863, was used for staining live cells for flow cytometry in PubMed: 18689689, http://www.pnas.org/content/105/33/11784.long. It is not clear how much of the protein is extracellular but it is expected to include the N terminus, based on studies of cell-surface CRT. The review FASEB J. 2010 Mar;24(3):665-83. at http://www.fasebj.org/content/24/3/665.long discusses these studies. Is the immunogen a fragment or full length protein? The immunogen for ab83220 is the full length recombinant protein. Conjugated abs gives signal, whereas the non-conjugated with secondary fails to do so. Secondary works fine with other abs. Are checking at the moment if pos. signal is non-specific with siRNA. Es tut mir leid, dass Sie Probleme mit diesem Antikörper hatten. Wie am Telefon besprochen habe ich eine kostenlose Ersatzlieferung mit einer anderen Lot# in Auftrag gegeben. Sie hat die Referenznummer 123456 und sollte Montag bei Ihnen ankommen. Als Anhang finden Sie die beiden Fragebögen für die Flow -Analyse der beiden Antikörper. Thank you for your enquiry regarding ab22683. We have removed Hamster from the "does not react" species list, this seems to be an error. We apologize for any inconvenience caused and thank you for bringing this matter to our attention.